Provide comfort for the family of Sherman "Cotton" Grant with a meaningful gesture of sympathy. Wilson - Funeral Services for Mr. Sherman "Cotton" Grant, 80 of Ringling are scheduled for 10:00 A.M., Monday, April 15, 2019 at Alexander Gray Funeral Home Chapel with Bryan Spivey officiating. Interment will follow to Belleville-Bourland Cemetery. Sherman Grant, known as Cotton to all his family and friends was born July 8, 1938 at Petersburg, OK to the late Mr. Hailey and Eula Grant. 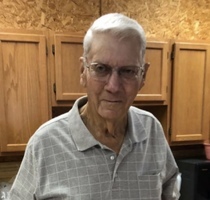 He departed from this life on Thursday, April 11, 2019 in Marietta. Cotton attended school at Courtney, he was the last to graduate to receive a Courtney High School diploma in 1957. He married the love of his life, Jacqueline Blankenship on January 31, 1959 at Ardmore, OK and they began their journey in life together. Cotton and Jacqueline started their own family in September of 1960 with their daughter, Deanne, followed by another daughter, Lisha in January 1962, their family was completed with their son, Kevin in December 1971. At a young age, Cotton began working at the Belleville Cotton Gin then for Badley Burkett Well Service, from there, he began his life long career of farming. Cotton was instrumental of starting the Courtney Fire Department and was the first fire chief, he helped with the construction of the Courtney Community Building and was a great help with the Belleville-Bourland Cemetery by helping with the upkeep of the cemetery and donating land. Cotton was a Dallas Cowboy, OU Sooners and Nascar fan. Preceding him in death are his parents; brother, Harvey Grant; and sisters, Marie Dewbre, Nelda Bechtol and Glenda Vinson. Cotton is survived by wife Jacqueline of the home; children, Sonia Deanne Grant and fiancee Bill Caldwell of Marietta, Lisha Dawn Scifres of Ringling and Kevin Dale Grant and wife Amy of Courtney; grandchildren, Heather Longest, Jeremy White, Krista Longest and husband Chisium, Travis White, Derek Grant, Joshua Grant and Kimberlyn Apala and husband Randy; great grandchildren, Connor, Rylee, Carter, Cannon, Ryker, Finley, Randon and Luke; sister, Lana Ball of Fritch, TX; brothers, Haskell Grant and wife Joann and Darrell Grant and wife Linda all of Lone Grove; sister in law, Retha Grant of Ardmore; brother in law, Jerry Vinson of Ardmore; brother in law and sister in law, Larry and Sherian Blankenship of Courtney; and many other family and friends. Pallbearers will be Kevin Grant, Randy Jackson, Denver Weatherly, Kerry Blankenship, Larry Don Blankenship and Johnny Dewbre. Honorary bearers will be Tankie Spivey, Gene Jackson, Gale Black, Sonny Mobley, Larry Blankenship and Mickey Pettit. The family will receive friends from 2-4 P.M. Sunday evening at Alexander Gray Funeral Home in Wilson. In lieu of flowers, donations may be made to the Courtney Community Center or to the Belleville-Bourland Cemetery Association. To send flowers in memory of Sherman "Cotton" Grant, please visit our Heartfelt Sympathies Store. We encourage you to share your most beloved memories of Sherman "Cotton" here, so that the family and other loved ones can always see it. You can upload cherished photographs, or share your favorite stories, and can even comment on those shared by others. Provide comfort for the family of Sherman "Cotton" Grant by sending flowers.